Chicken adobo is the dish. One dish to rule us all. This is the only Filipino dish that usually makes cookbooks. 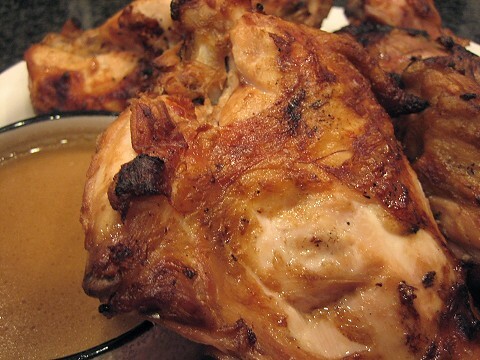 Bittman's Best Recipes in the World includes a recipe for chicken adobo. I was a little bit surprised to see that The Silver Spoon , the supposed Bible of Italian home-cooking, has a chicken dish it calls Chicken Philippine style. When people -- Filipinos and non-Filipinos alike -- talk about Philippine cuisine, the dish they inevitably talk about is chicken adobo. At home, we have chicken adobo quite often. If I were to hazard a number, I would say it's about twice a month. It used to be more frequent (think once a week), but we've cut down on the number drastically since last year. I actually find myself not wanting chicken adobo as I age: there's something about the stewed chicken pieces sitting in liquid, skin all loose and straggly, that does not appeal to me. Then there is the problem of overcooking, which is quite prevalent in our house. Overcooked chicken in semi-dishabille: just not very appetizing for me. Now, I am not saying all chicken adobos are like the chicken adobos we have in our house. Probably, those that are out there in other kitchens and in other houses are better than what we've had in the past. I do not want to be accused of shooting down the Philippines' national dish. I happen to like the flavour combinations in a chicken adobo: salty, sour, garlicky, peppery, with a hint of bay. I've read of other chicken adobos that are stewed first then fried to a crisp. This, I thought, is a good solution to the lewd dishabille that our chicken find themselves in in our pot. I want to try this "radical" idea in our house, in the hopes that it will rekindle my love for chicken adobo. Having eaten a lot of chicken adobo in my childhood does not mean that I actually know how to cook chicken adobo. I asked around and searched for recipes for chicken adobo. 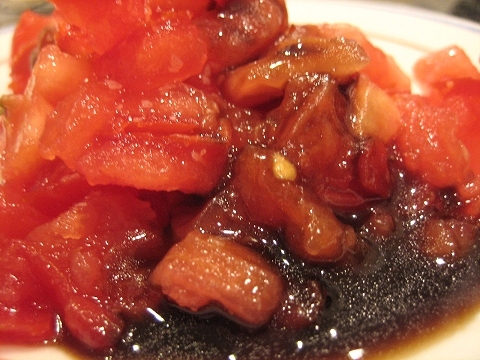 I came across Romy Dorotan's recipe for the dish. Romy Dorotan is the chef-owner of Cendrillon and I saw him appear on Martha Stewart a long time ago. He and his wife have a book out called Memories of Philippine Kitchens . His recipe for adobo is a little different from our household recipe, since we've never added coconut milk to our adobo ever. 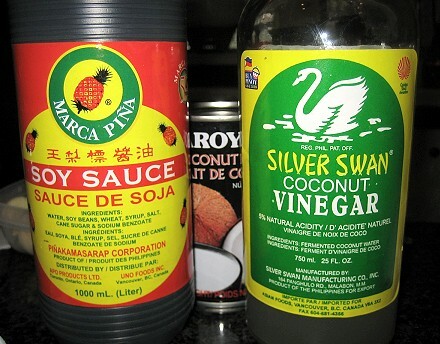 I don't know if adding coconut milk is traditional in chicken adobo or whether it's a variation that Mr. Dorotan came up with to mellow and round out the flavours, specifically the astringency of the vinegar. The whole thing (chicken and marinade) then goes into a pot and cooks for about 20-25 minutes, boiling then simmering gently. Since I knew I was either going to put them in the oven to dry-cook further, I wasn't too concerned about the time. 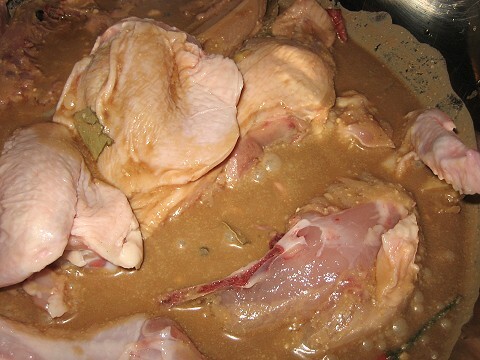 20 minutes is sufficient to cook a small chicken cut up into parts. When I checked on the chicken after 25 minutes, I was afraid, because there it is again, chicken with loose skin all straggly. It really, really did not look very appetizing at all. We spared you the sight. I had to leave at this point and since TS was already firing up the grill, we thought it would be a good idea to finish the chicken pieces off via the grill. We always have good timing when it comes to firing up the grill. The chicken pieces were grilled just until they had that charred flavor. Can I just say how much I love this dish? This chicken adobo hits the spot. 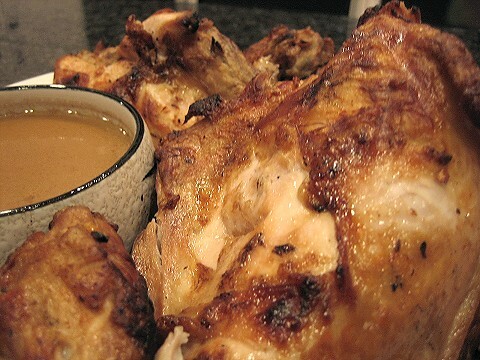 This was so delicious that we'll be making our chicken adobo this way from now on (marinade, wet-cook, dry-cook). 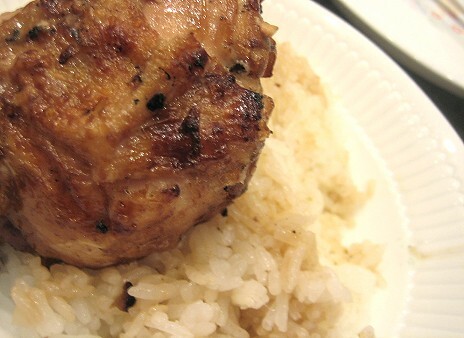 This chicken adobo can use more garlic and more heat (my personal preference), but overall, it is good as it is. This is now my preferred style of chicken adobo. And please, no messing about. This has to be eaten with white rice. Rice + Chicken + Sauce is the way it should be. This year, not eating meat on Good Friday was suddenly the fashion. I do not subscribe to this myself, but we did have guests trying to observe this non-meat eating thing. We thought we'd oblige them. One good thing about putting together a "vegetarian" meal is how fairly quickly it is to put together said meal. We had to work on Good Friday, up till around 4 in the afternoon. Our dinner guests were coming in at around 7 in the evening. Given the time constraints -- and I suppose, the occasion -- we kept the menu very simple. 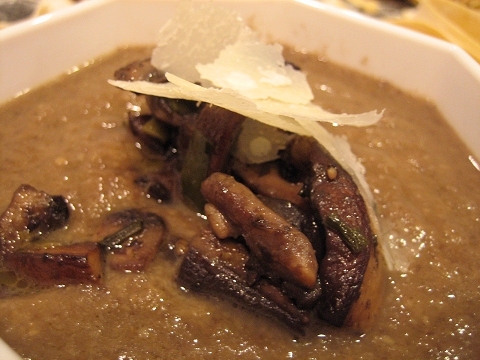 We had a lot of good old button mushrooms hanging about our fridge, so we thought to do a mushroom soup with it. We didn't really want a cream-based soup. Although I didn't follow a recipe when making the soup, I happened upon Bourdain's recipe for mushroom soup (from his Les Halles cookbook). It's quite funny. 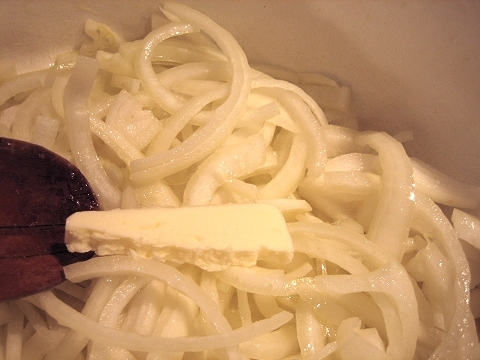 I sweated onions with butter then added in the button mushrooms. 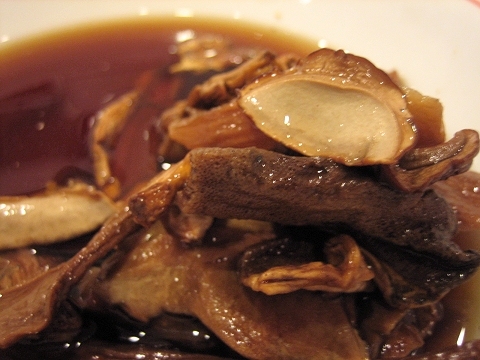 To "astound [our] guests with a Wild Mushroom Soup" (haha), I also soaked just a tiny bit of dried porcini mushrooms to add to the mix. They smelled so much like those dried cuttlefish snacks! Weird. 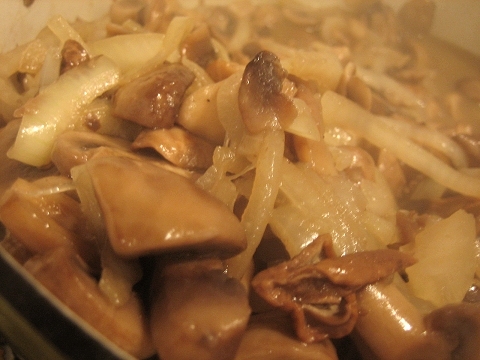 I cooked the onions and mushrooms until soft, then added in some chicken broth (from a tetra pack! sorry). 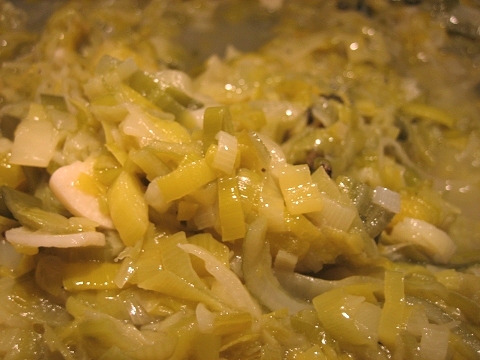 I added the green parts of the leeks from our leek pasta below as well. After sort of forgetting about that for a while, I eventually used the hand blender to blend the whole thing (minus the leek greens). We served it with some sauteed portobellos from out mushrooms on toast snack and garnished with shaved Parmiggiano-Reggiano. 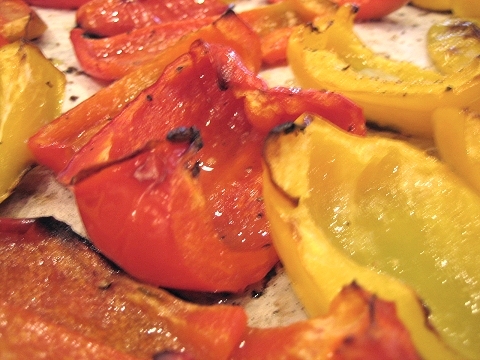 My mother bought some red and yellow peppers that day, because she wanted some roasted bell peppers to serve. I cut up 6 of the peppers and did not want to cut up more peppers. We figure that 6 peppers were not enough to satisfy 12 people, especially when they're individual roasted pieces. The solution? 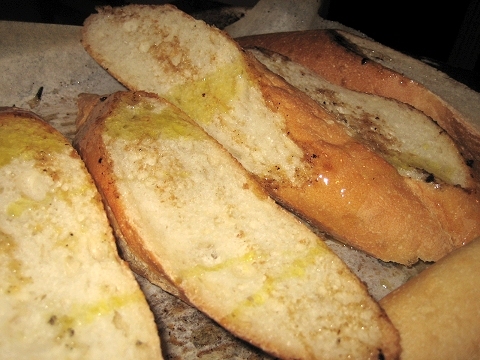 Chop up the pepper pieces and put over a baguette. 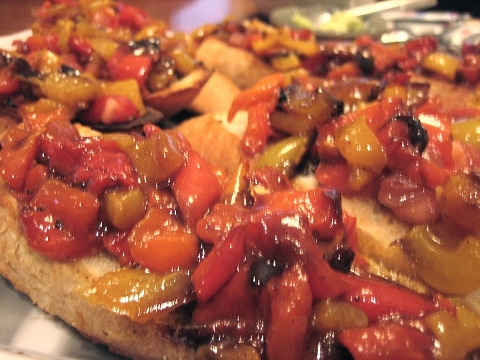 Thus, the roasted bell pepper bruschetta was born as another starter. These are the worst pictures of the bunch. I don't know what happened. Simple and straightforward, this one. We roasted some peppers and toasted some bread. I used the same pan for the bread that was used for the peppers. That way, the bread soaked up the residual bell pepper-y oil left on the pan. One less pan to wash, too. Smart, see. We had a couple lonely tomatoes lying around, so I diced those as well and added some of my world-famous balsamic vinaigrette. 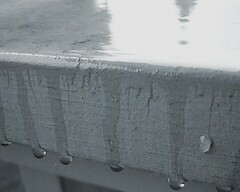 The only barely "acceptable" shot in this dish. 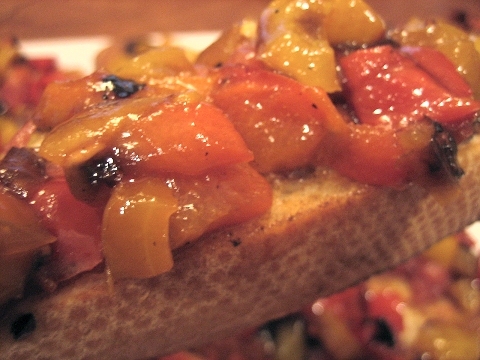 I mixed the tomatoes and the roasted peppers (which I've diced) and on top of the toasted bread they went. A drizzle of balsamic vinaigrette on top, and done! For our main dish, it was another simple dish. 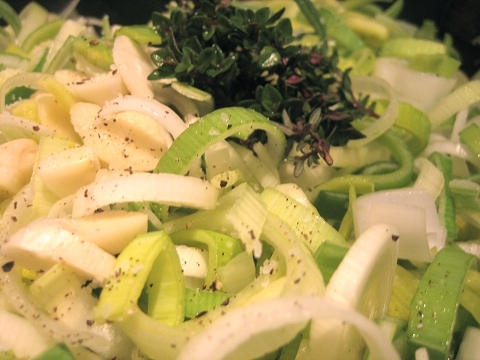 We wanted to do a pasta with braised leeks. This would've been good with BACON, but since we couldn't do that, we decided on bread crumbs for the textural difference. 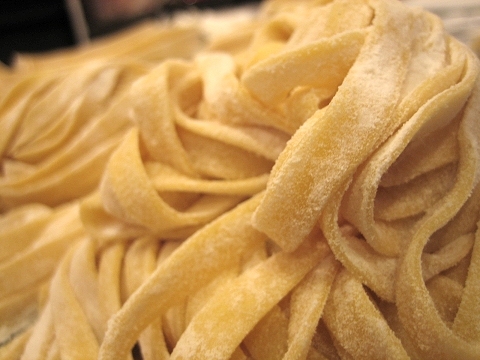 To dress this very simple dish up, we decided on fresh pasta cut into fettuccine. 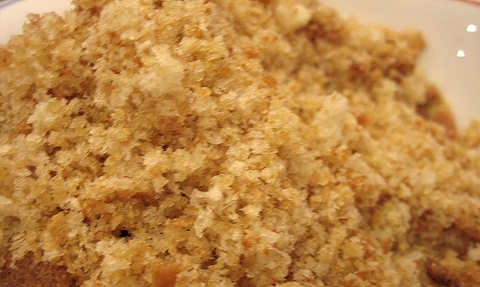 First thing, toasting and making the bread into crumbs. 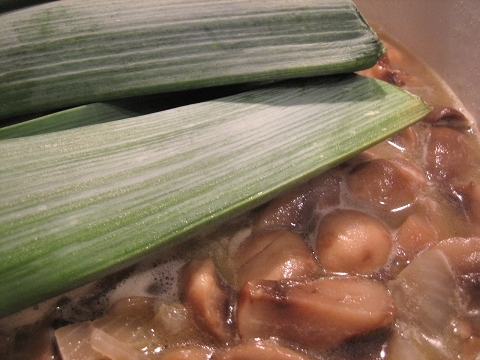 Now, for the leeks. 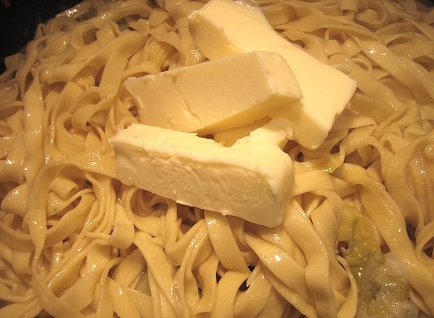 Oooh, butter! This pasta dish was a little bit butter-intensive... for us, anyway. It's more or less a dump-into-a-pot dish. 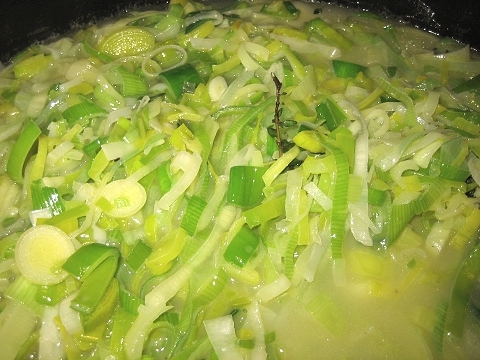 Leeks, garlic, thyme and some homemade chicken broth went in. Then, it was waiting for them to cook down. 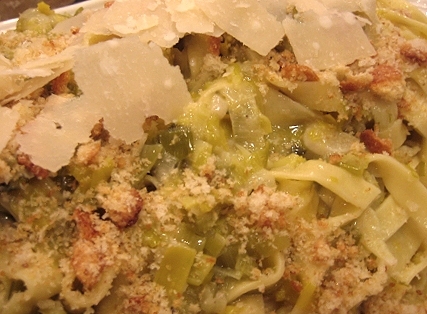 When the leeks were ready, we just needed to cook the pasta -- fresh pasta we made, of course. Look, so pretty! We used the fettucine cutter this time, no more of this maltagliati business. And here's another shot, just because it's so BEAUTIFUL! Professional-looking, dare I add? 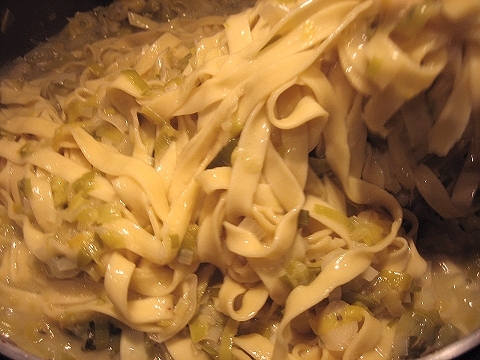 We tossed the fettucine with the leeks and added just a touch more butter. 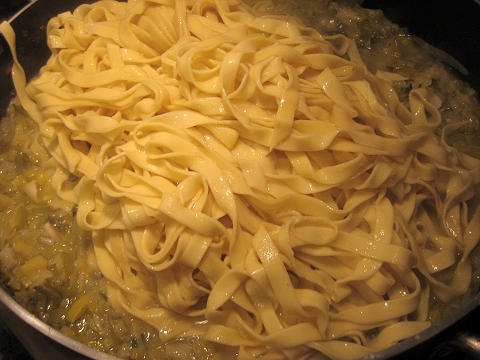 The boiled pasta looks beautiful! Apparently, we can't stop tooting our own horn. 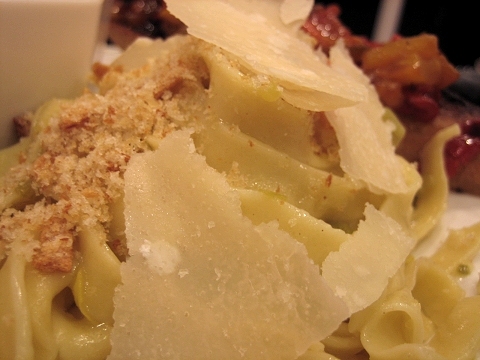 We garnished the dish with toasted bread crumbs and shaved Parmiggiano-Reggiano. All in all, quite a satisfying meal for me. 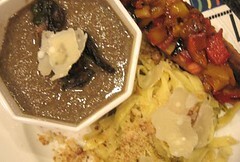 I was happy with the mushroom soup and especially happy with the fresh pasta. 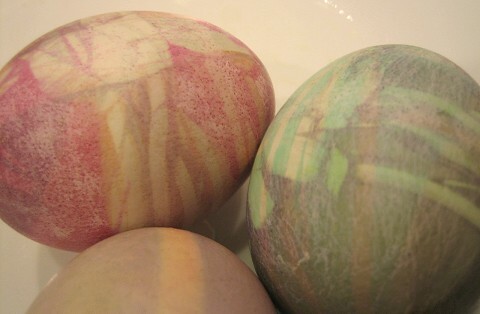 Out of the blue, our little bosses decided that they wanted to dye some eggs. 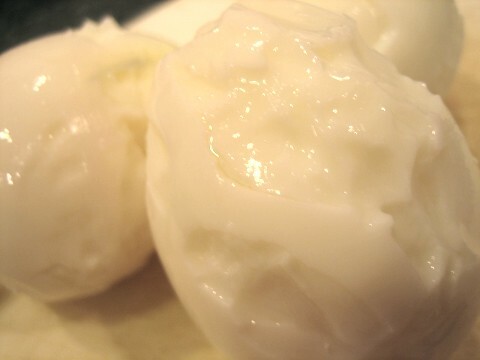 Taking the easy way out, we did this with hardboiled eggs. We made 5 eggs, and the bosses ate one each. 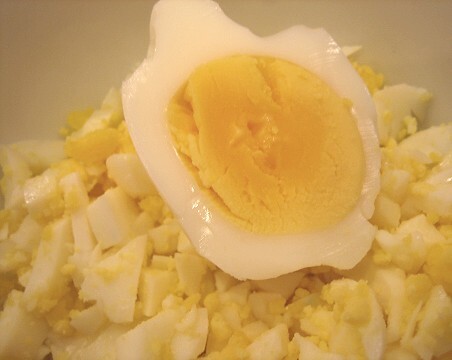 I was left with 3 eggs, so I decided to make egg salad. They're so ugly that they've crossed the line to pretty. 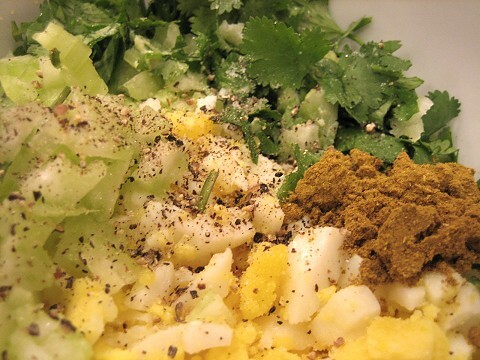 Into the chopped eggs went some Madras curry powder, celery, cilantro, (s&p, of course) and mayo. I had mine in an Olafsen flaxseed "breakfast pita". 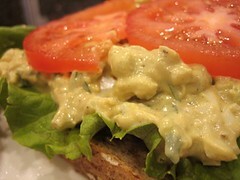 The egg salad really went nicely with this, a favorite "bread" of mine. It's not really very pita-y in look and taste, as it's more pillowy, and it has the slightest hint of sweetness. (Available at Costco.) I ate the lot with some sliced apples. 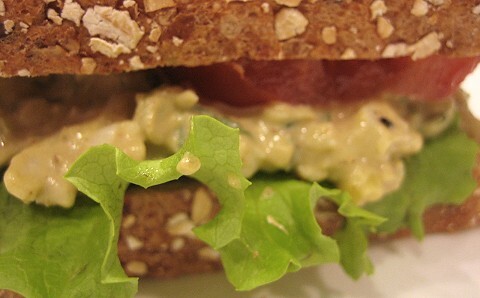 JS decided on a more traditional route, having it on multigrain toast with some lettuce and tomatoes. Either way, it was delicious, gloopyness notwithstanding. After seeing this lamb ragu at ceF, I wanted to have a plate. 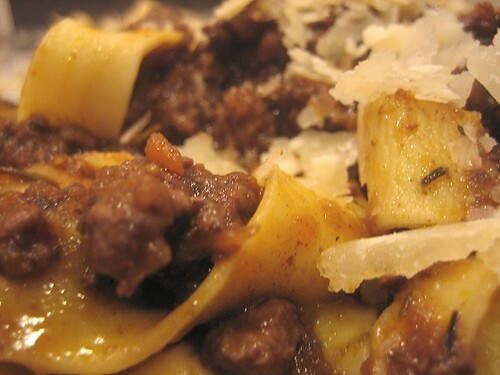 I searched my database of good Italian restaurants around town who would serve ragu. 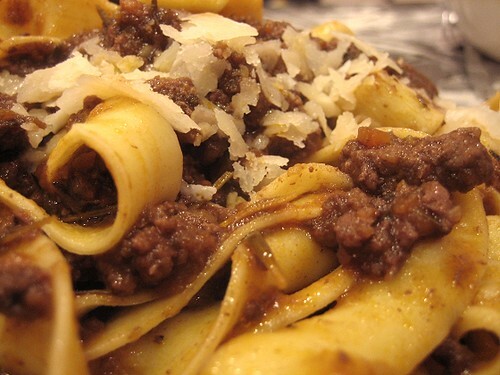 I had a ragu Bolognese at La Buca the first time I ate there, but I didn't think they would have it on the menu right now. 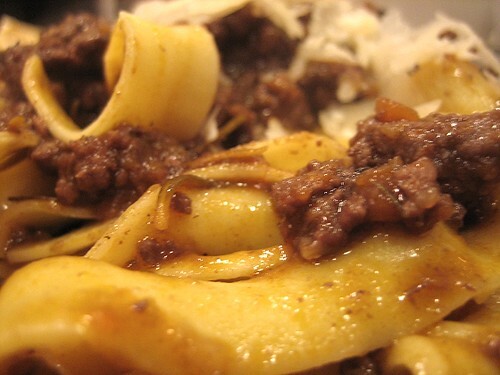 Besides, ragu, from all the recipes I've read, seem fairly straightforward and does not seem to require any great technical skill. Which makes it my kind of cooking. I'm not a good cook and I'm always happy to see uncomplicated recipes. First, the mirepoix of celery, onions, and carrots. 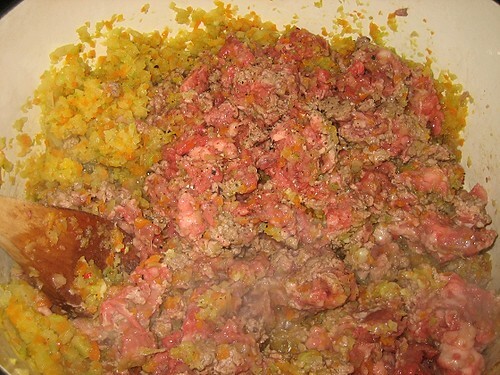 You can chop and fine-dice these vegetables by hand or you can use the food processor to mince them. My choice: food processor. I'm not that fast and fine with my knife skills. 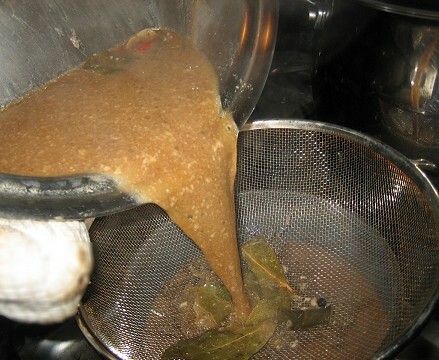 Besides, I've read somewhere that mincing them in the food processor makes these vegetables give up a lot of their liquid, something to be desired in the making of a meat ragu. 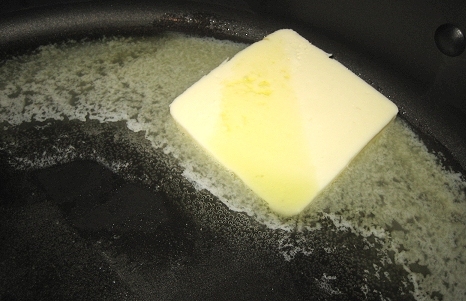 Olive oil and butter to coat the bottom of the pan, which in this case is about 4 tablespoons of olive oil and a knob of butter. Saute the vegetables until soft. Depending on how much patience you have, you can even saute it until caramelization. I don't think I did that here because I just wanted to get the lamb inside the pot. Lamb in with the vegetables. Again, browning is crucial. The better the meat is browned, the bigger the flavour. This is about 3 pounds of ground lamb, half of that leg of lamb I ground up the day before. When the meat is sufficiently browned -- again, I'm not sure I got to that stage of brown to the power of brown -- add the tomato paste. I used a small can of tomato paste, which is about 150 ml. 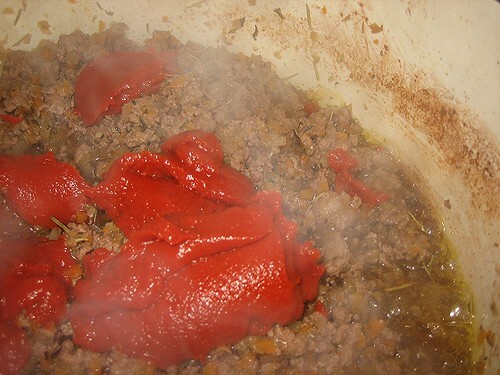 I used the whole can because I do not want leftovers of tomato paste. Then the red wine. This was about 2 cups of red wine, because that's all we had left of red wine. 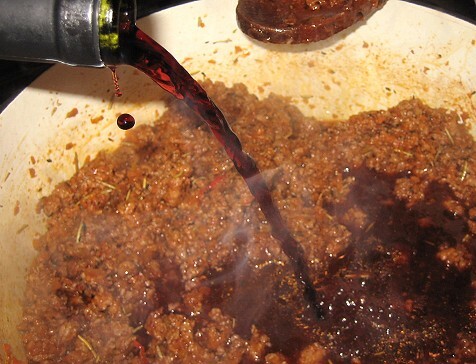 I let the wine the meat with wine cook down for a bit, then I added the herbs and water. I was too lazy to get fresh herbs so I stuck with dried herbs. I added rosemary and thyme for the herbs. 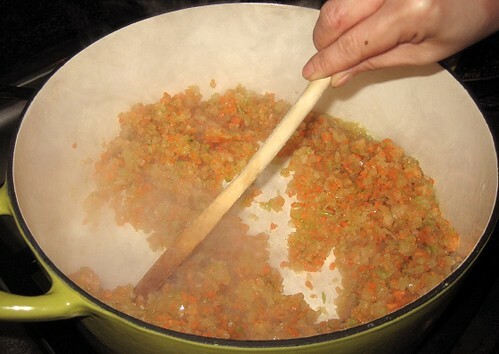 The ragu has to simmer for at least 3 hours, so water is needed to ensure that the ragu doesn't burn. Simmer uncovered. Check every once in a while to see if more water is needed. Check periodically for seasoning. 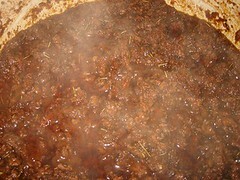 You can simmer the ragu for longer than 3 hours of course (I've heard of 7-hour ragus), but I tasted mine after 3 hours and I was pretty happy with the result. It tasted like the ragus I had when we went to Bologna and Tuscany. 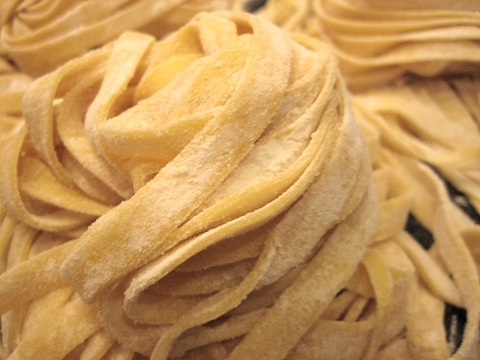 We also made some fresh pasta for another dish that weekend so I nicked a portion of the dough and made them into papardelle. Very, very good. I'm always amazed and grateful when something I've "cooked" turns into something edible. I am grateful for the infinite wisdom of Italian grandmothers. This was a whole bowl of goodstuff. I grated some pecorino romano on top of it for a nice salty tang, which contrasted nicely with the brown richness of the sauce. Mint would also be nice on top. One lesson learned is to use fresh herbs next time, because when I reheated the ragu the next day to eat, I think the dried herbs kind of burned. I tasted a little bit of scorched leaf. And thus deliciously concludes the first dish of my Home-Ground Lamb series.